One of the most frequently quoted descriptions of vampires in English is referred to as a translation from a dissertation on vampires published in Duisburg in 1733, the only German book on vampires written and published in this part of German territory. The original translation of the description is found in an anonymous manuscript, The Travels of three Gentlemen, from Venice to Hamburgh, being the grand Tour of Germany, in the Year 1734, first published in volume IV of The Harleian Miscellany: A Collection of Scarce, Curious, and Entertaining Pamphlets and Tracts, as well in Manuscript as in Print in 1745, and continued in the subsequent volume. The landlord of the three gentlemen, 'a cheerful agreeable person, and a man of very good sense and understanding,' 'seemed to pay some regard to what Baron Valvasor has related of the Vampyres, said to infest some parts of this country'. In this connection, the author mentions a dissertation upon vampires written by the director of the gymnasium in Essen in Germany, M. Jo. Henr. Zopfius, 'from whence we shall beg leave to transcribe the following paragraph'. Not being satisfied with just quoting either of these English translations (or transcriptions? ), I have looked up what the director of the gymnasium in Essen actually wrote. 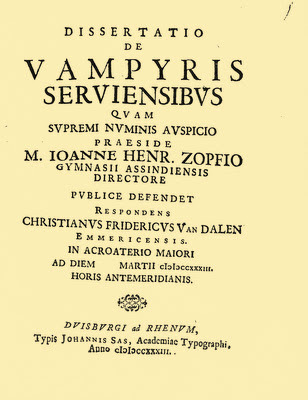 Zopf's Dissertatio de Vampyris Serviensibus consists of 27 pages written in Latin, and when you start looking for a text like the ones in English, you find that it is actually adapted from two bits of text on pp. 6-7. It is the last sentence that refers to the spectres of dead people, who come forth from their graves at the dead of night, throw themselves upon sleeping people, and leave them to die, drained of blood. 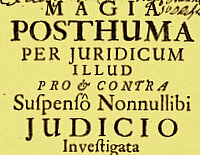 In short, the English translations are close to the original text, but not literal. Also, if you take a look at the beginning of the previous paragraph, you can see that both the anonymous gentleman and Summers chose to omit the reference to Medvedja ('Medvedia') in Serbia. John Swinton (1703–1777) was a British writer, academic, Fellow of the Royal Society, Church of England clergyman and orientalist. In 1731 he was a fellow of Wadham College, Oxford, but migrated to Christ Church in 1745. He contributed to George Sale's Universal History. Swinton also contributed articles on the transcription of the 'Ruins of Palmyra'. Beginning in 1749, Swinton donated a number of Roman coins to the collection at Christ Church. From 1767 until the year of his death he was Keeper of the Archives at Oxford University. As Schroeder remarks, the English gentleman (the Rev. John Swinton, apparently) probably could not read most of the books on vampires, because they were written in German. For that reason he referred to Zopf's dissertation in Latin, and his transcription and the later adaption by Montague Summers made Zopf a household name of vampire books and web sites in English. Johann Heinrich Zopf himself was born in 1691 and died in 1774, and you can easily find biographical info like this, as well as a number of books by him on the internet.